As you’ll be composing and displaying images on it the screen has become one of the key features and it goes a long way to define the device and its handling. Inside there’s a high capacity (4200mAh) battery that, Like other Huawei smartphones, delivers an impressively long run time that’s measured in days rather than hours. And like the Huawei Mate 20 Pro, the P30 Pro uses wireless charging, and that includes the option of reverse charging of other wireless devices. Although counterintuitive, the long-lasting battery of the Mate 20 Pro and thus the P30 Pro is surprisingly useful if you’re running two handsets. Naturally the front utilises glass to allow the wireless charging, but as Huawei bundle a transparent, non-slip rubber case the P30 Pro can be held relatively securely. 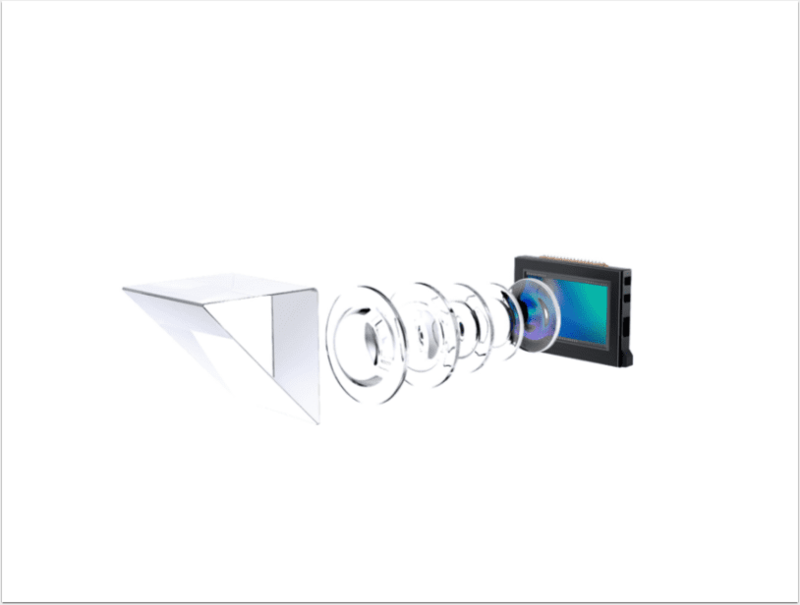 The redesigned Leica quad camera as Huawei calls it is based around a primary camera with a optically stabilised wide-angle 25mm equivalent focal length and fast F1.6 aperture. 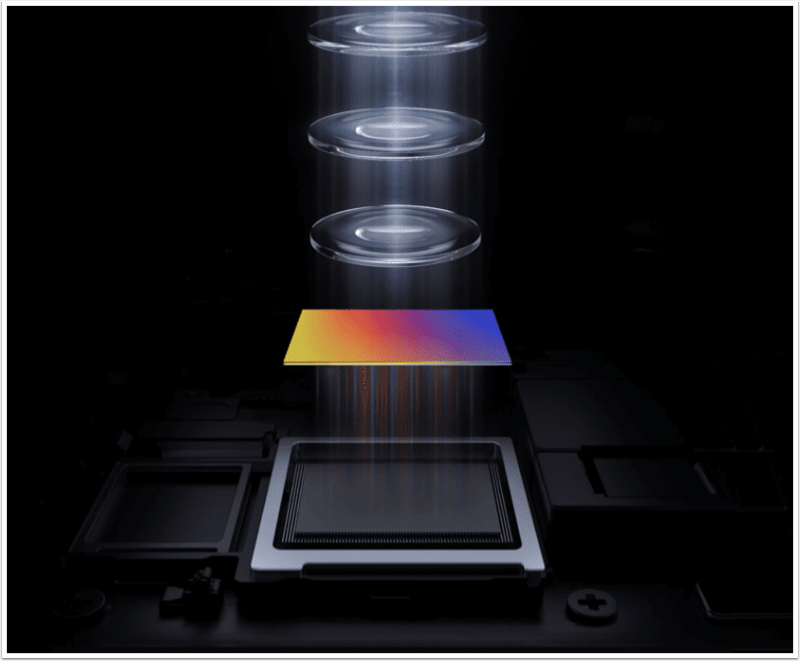 Behind the fast lens of the primary camera sits a large 1/1.7-inch 40MP CMOS type sensor with what Huawei call a SuperSpectrum RYYB filter array instead of the usual RGGB Bayer type. According to Huawei, the new filter array lets through around 40-percent more light to the pixels beneath. Additional signal processing and a specially developed algorithm is required to adjust the colors to make them appear natural and from initial images we’ve taken with the P30 Pro looks promising. Sitting to the right, beside the main camera is an ultra wide-angle 16mm equivalent F2.2 non-stabilised lens in front of a 20MP sensor. It’s not clear at this time whether it’s an RYYB type. It would be a benefit with a slower lens like this but as Huawei themselves don’t call it a SuperSpectrum sensor it has to be said it’s highly unlikely. 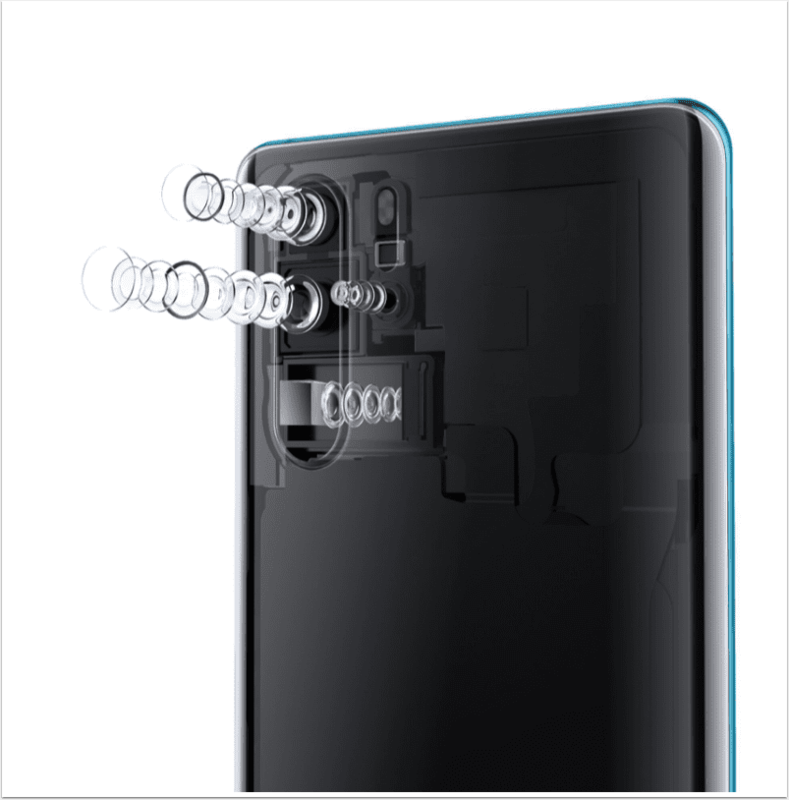 With a tell-tale square cover glass denoting folded-optics, sitting to the right of the main-camera is the P30 Pro’s coup de grâce. 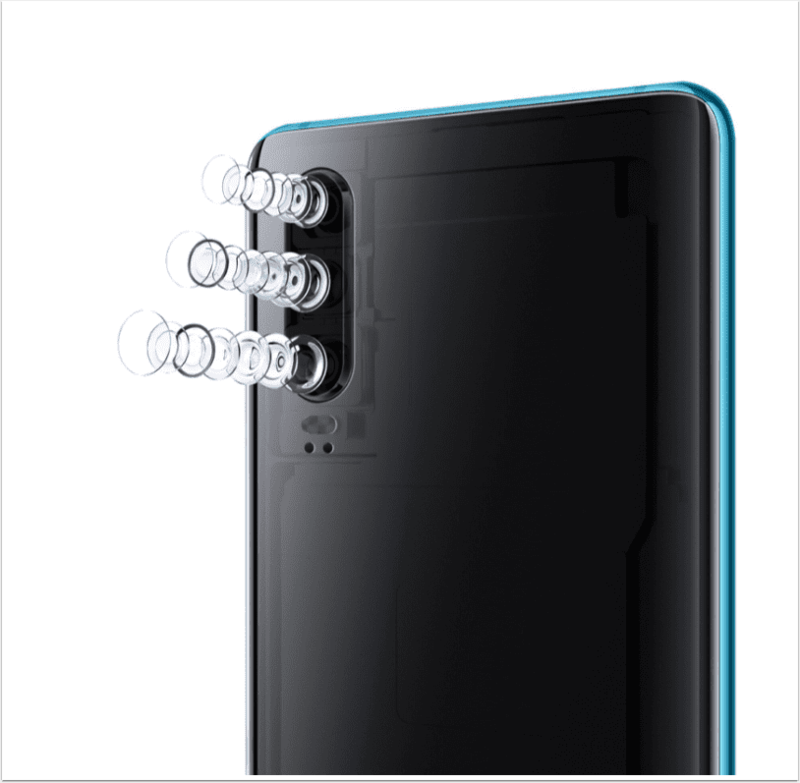 Although the focal length isn’t specified in the marketing material, it’s mentioned on the device’s casing as an 125mm equivalent focal length F3.4 lens with optical stabilisation and an 8MP CMOS sensor. Folded optics aren’t new, they’ve been successively used in ultra-slim pocket cameras for years – the Sony Cybershot T300 was and other device makers have been touting similar designs, but this is the first to market in a smartphone. Sometimes referred to as “periscope-style" optics, the design utilises prism or mirror or combination of the two to enable the longer focal length necessary for a telephoto to be housed in the body on its side with the optics and sensor at right-angles to the screen and casing. The fourth camera is a time of flight (ToF) sensor rather than a camera in the traditional sense as it uses a separate IR light source to measure the object distance for improving autofocus accuracy and for modelling depth maps used in bokeh simulation. Working in conjunction with the ultra-wide, main and zoom lenses images are a hybrid of digital and optical zooming giving an approximate 16-125mm range. With the aid of very complex computational imaging techniques that involve merging multiple frames together from the three sensors depending on the selected zoom setting, images can be digitally zoomed from 16mm to 125mm equivalent and then purely digitally to approximately 50x magnification. Potentially that’s 1250mm equivalent but more testing is necessary to confirm that. Another welcome feature is the often overlooked macro capability. The P30 Pro focuses down to just 2.5cm, and there’s a x3 zoom option that allows you to observe and capture details greater than life size. Given the complexities involved in image fusion, the seamless end result is very impressive. Optical stabilization isn’t required on the ultra-wide lens but it’s essential on both the primary and telephoto camera, especially the latter and it works very well indeed. Low-light stills with the main camera and its innovative RYYB sensor is especially impressive with excellent exposure judgement even in extremely low light levels and with the ability to hike ISOs up to 409,600. To get the best from it you have to select the dedicated Night mode from the scrolling Shooting mode menu. Why this menu doesn’t re-orient when held horizontally, like some of the icons, is probably down to keeping the display clear of distracting text. It’s a minor detail but it would have been nice to see or at least to include it as an option. Video maxes out at 4K (UHD) at 30fps but you can zoom up to 10x magnification and there’s image stabilisation, though it’s not clear if it’s a combination of optional and digital or simply the latter. 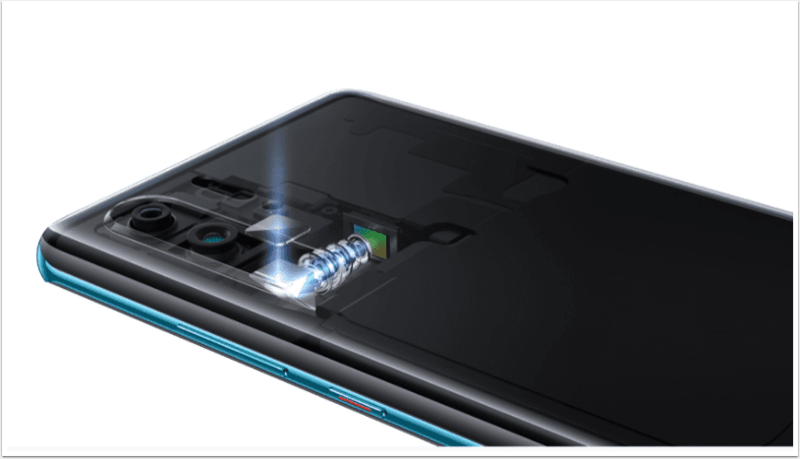 Low-light clips are also impressive, perhaps more so in FHD where variable frame rates are employed dropping from 60 fps in bright light to 30 fps in low-light to allow slower shutter speeds making the P30 Pro a highly attractive impromptu video-cam.